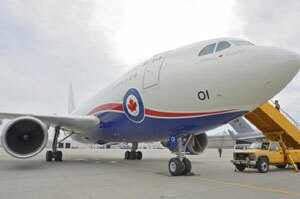 July, 2013 - Ottawa: The Electronics Test Centre recently reached new heights with its completion of T-PEDS testing on the CC150 (A310) POLARIS jet used by the Prime Minister’s office. T-PEDS (Transmitting Portable Electronic Devices) testing is performed to ensure that electronic devices such as cellular phones, tablets and laptop computers do not adversely affect onboard electronic systems critical for safe operation. Such test results are used for certification of the aircraft by Transport Canada. The Electronics Test Centre’s Aero Test Group has performed testing on over 30 wide and narrow body commercial transport aircraft for a variety of air carriers and manufactures, including, in 2010, testing on Air Canada and JAZZ airplanes which cleared the way for use of cell phones during the taxi-in to gate phases of flights. While ETC’s Aero Test Group is developing a reputation for its passion and expertise on the runway, back in the laboratory, the Electronics Test Centre applies its expertise in High Intensity Radiated Field (HIRF) testing and Lightning Induced Transient Susceptibility testing of airframe sections and aircraft subsystems. Since the late 1980s, ETC has performed EMI/EMC qualification and development testing on equipment ranging from the smallest black box to air craft fuselage components in our laboratories and to off-site full-scale aircraft, nuclear reactors and ships as part of the Aerospace, Defence, Commercial, and Automotive, markets served. "Design-to-delivery" consultation services meet both International and North American requirements. Laboratories are located in Kanata, Ontario and Airdrie, Alberta.